ARC'TERYX Andra Coat. Light enough for summer showers, protective enough for driving winter rain, the Andra Coat provides waterproof, breathable protection from city storms. The 3L GORE-TEX fabric with GORE C-KNIT backer technology is soft, quiet and lightweight. 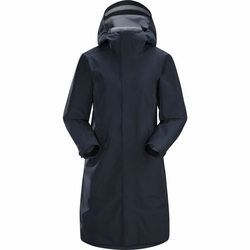 The length provides extended coverage, and the hood adjusts for a custom fit. The clean, minimalist design and relaxed A-line silhouette give the Andra a look that fits any urban environment.